Does the Ikea Ektorp Slipcover Fit Pottery Barn Basic? Does the Ektorp Sofa Cover Fit Pottery Barn Basic Comfort? I love how inexpensive the standard Ikea slipcovers are and have been curious on whether or not they fit other slipcovers, like my second hand Pottery Barn roll arm sofa. 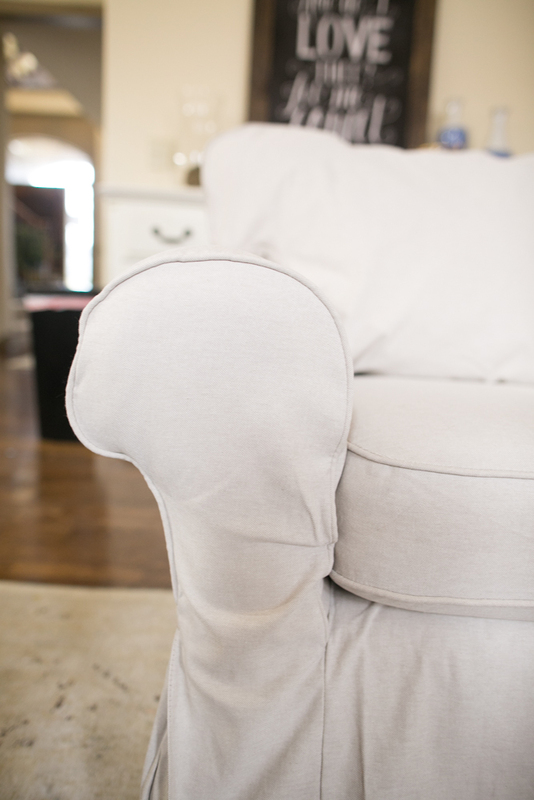 In this post, I show you if Ikea slipcovers fit on non-Ikea furniture! As you guys know, I’m in love with my slipcovered sofa that I splurged on a few years ago [HERE]. I also wrote about the truth of having white slipcovered sofas with kids [HERE] and why I chose the Pottery Barn sofa over the Ikea Ektorp. My slipcovered Pottery Barn Grand Sofa of my more expensive pieces of furniture in my home (which was a deal on a floor model). 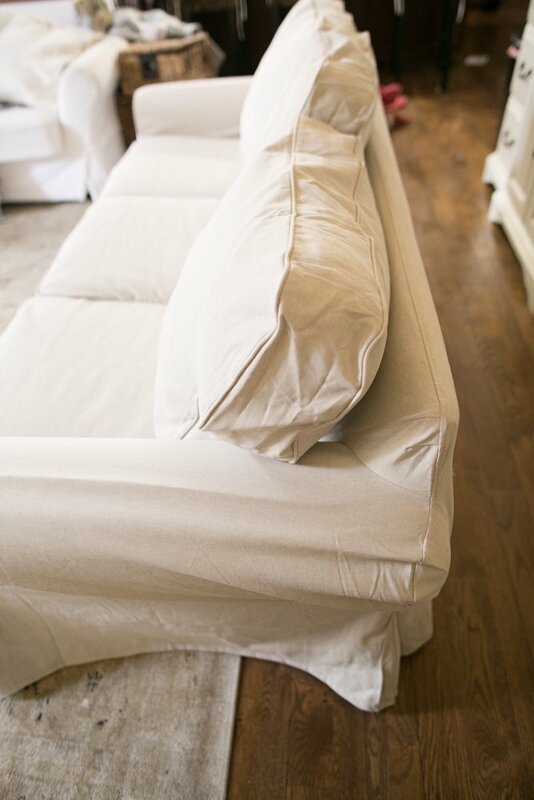 I’ve had many slipcovers made for it with my everchanging need to change up our space! We are getting ready to start another project – renovating the loft area on the second floor. I wanted a cohesive look by purchasing another slipcovered sofa. I considered buying the Ikea Ektorp because of the similarity, but I didn’t want to spend $499 on a sofa. I know, that’s kind of ridiculous considering I spent over $1,500 on my Pottery Barn Sofa. I’m a huge advocate of finding things at a deal when I can. However, when I have an idea or design in my mind, I’m usually always looking for a specific piece. Often, I’ll try to find the exact same thing on Craigslist, Facebook Marketplace or my company’s online garage sale intranet as my first stop for shopping for the perfect piece. I got lucky and found a Pottery Barn Roll Arm Basic on Facebook Market Place listed for $250 with an ottoman! That is more than half off of the similar Ikea Ektorp. I was able to negotiate it down to $225. Obviously, I knew I had to replace the cover. 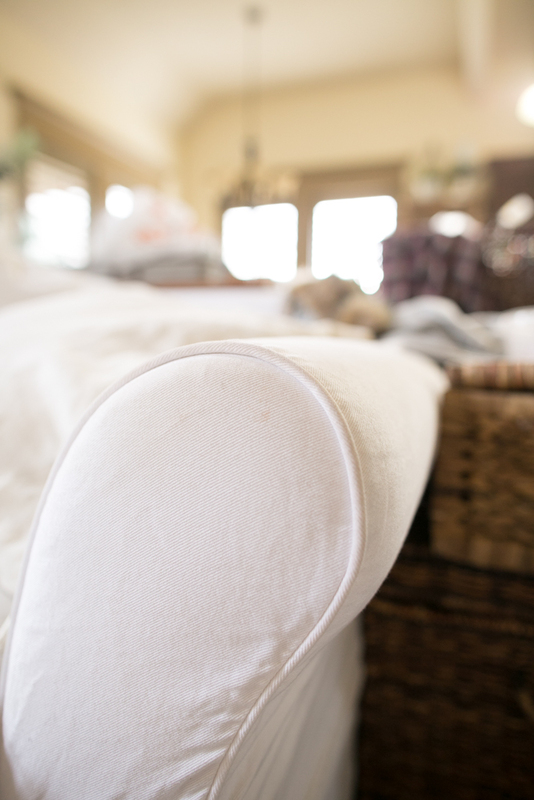 Pottery Barn brand slipcovers can cost anywhere from $300 – $2,500 depending on the type of fabric you get. You can also get slipcovers made from other online stores for less than $375 (including Amazon [HERE]). However, Ikea always offers a standard slipcover for under $50 typically. 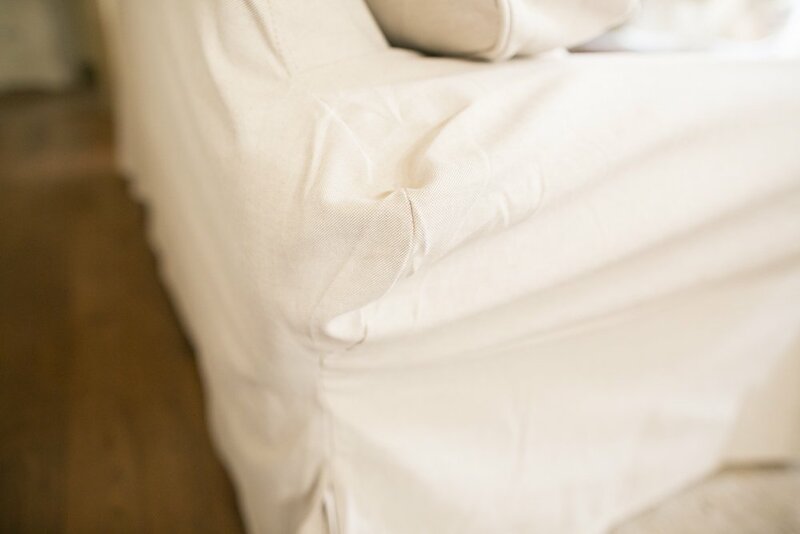 While the fabrics change OFTEN, they always offer an inexpensive version. This year, they offered the Lofallet beige for only $29. I mean, for that price, I wanted to test out whether the Ikea Ektorp sofa could be used with the Pottery Barn Basic. Below are a few slipcovers that caught my eye! I will say that going into your local Ikea store is WAY cheaper than buying one online. HOWEVER, just know that the under $50 slipcovers are neutral and the prices go up at Ikea based on the slipcover fabric and design. Check out my stripe slipcover sofa that I got custom made if you are the adventurous type here. Guess what? It does! 95% match. There are a few areas around the roll arm and the back that don’t 100% fit, which causes some fabric to be a little saggy, but it’s not too noticeable. In this image below, this is what a fitted Pottery Barn brand slipcover should look like. Here’s how an Ikea Ektorp slipcover looks like on a Pottery Barn Basic frame. Those are really the only two areas that don’t 100% align with the Pottery Barn frame. Would I rather pay $29 over $300+ on a Pottery Barn slipcover? Yes, anyday! I can live with this little wrinkle. Anyway, because I have little kids and I know they’ll tear this sofa up anyway, I’m keeping this slipcover even if it’s not perfect. Heck, I plan on buying two more in the event they tear this one up! Could you live with those little wrinkles without a perfect match? 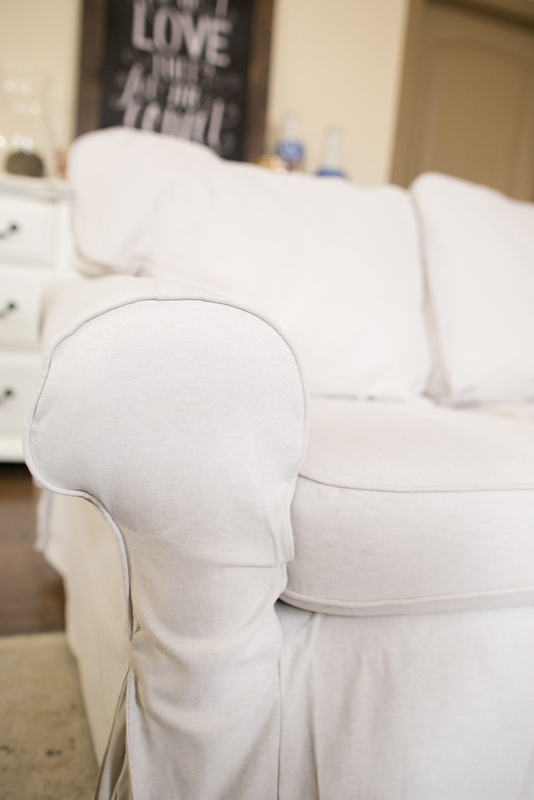 If you just want to try it, it literally is under $30 for a slipcover from Ikea! Try it out. If you are on the fence on whether to buy an Ikea Ektorp sofa or a Pottery Barn sofa that looks similar, check out my comparison between these two big brands that are known for their slipcovered sofas [HERE]. 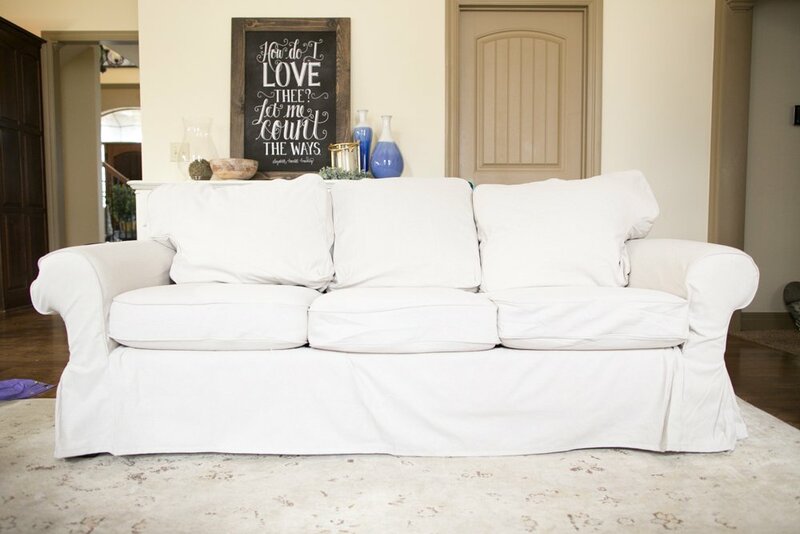 And if you aren’t sold on either of these brands, but love the look, I’ve also rounded a few of my favorite slipcovered sofa that have the neutral, cottage style look (and the ability to take off the cover to wash it). However, I can’t promise you the inexpensive Ikea slipcovers will fit them! This sofa set looks so beautiful yet comfy, Seng! One of my friends is an interior designer, and she has told me about this sofa. It looks perfect and trendy. Do you happen to know if your PB basic sofa is the old style or new? I am wanting to do this but am not sure which of the models fits the slipcover. This is great!!! We were given a pottery barn slipcover couch almost 9 years ago and it is seriously the best thing ever. So much, we bought a PB couch, chair and ottoman that matches off Craigslist. It was almost brand-new! 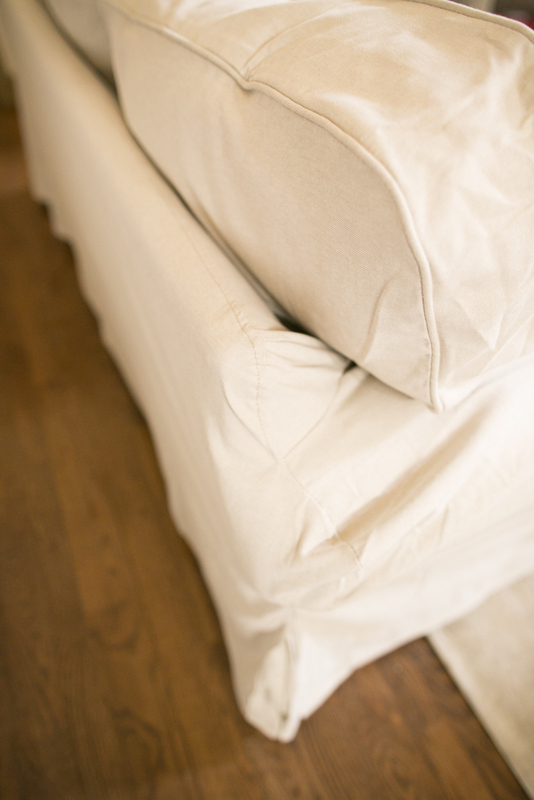 Our slipcover bit the dust (we have eight kids) but the couch, itself, is holding up perfect. I just bought the IKEA slipcover in hopes that it will work. I happened to google it AFTER I hit buy and found your post and am even more excited now!!! !